« They lived happily even after ….. 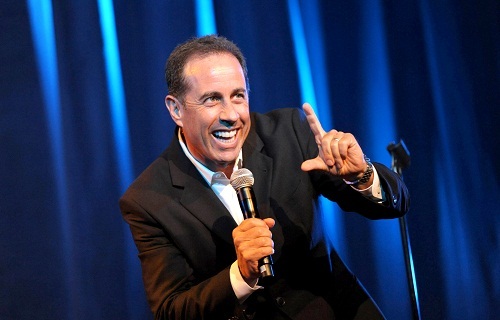 Wisdom from Hollywood’s richest actor …..
Worth an estimated $820million, the critically acclaimed comedian Jerry Seinfeld was recently asked how he had become such a great comic writer. He replied, "You have to be able to write funny lines, and the best way to write funny lines is to write every day." Seinfeld has a large calendar on his wall and every time he completes his daily writing he puts a big red X on that day. Seinfeld went on to say, "After a few days you’ll have a chain. Just keep at it and the chain will grow longer every day. You’ll like seeing that chain, especially when you get a few weeks under your belt. Your only job is to not break the chain." Human behaviour expert Professor BJ Fogg says that the consistent completion of small, manageable tasks is the best way to create a new habit that ultimately leads to mastery. - every year from 15th June to 15th September, the designer Philippe Starck goes into seclusion and works 12 hours a day every day. - after training, England rugby hero Jonny Wilkinson would keep practicing goal kicks until he successfully kicked 50 goals. If he missed on the 49th kick out of 50, he would start again at 1. - Picasso would only see visitors after he had fulfilled his work schedule on six consecutive days. In his book Unthink, Erik Wahl says that the paradox of creativity is that structure creates freedom. When it comes to doing the work that you were born to do, the discipline of consistent routines, rituals and schedules allows the space and focus for creativity to flourish. And as we know, it’s only the focused who flourish. Turning to the King of Tonga the Queen Mother said, "I’m sorry about that." "I thought it was the horse," replied the King of Tonga. Whilst waiting anxiously at the bar for her first date to arrive, a woman struggling to control her nerves farted loudly, causing people to look at her now blushing face. Quick as a shot the woman turned to the Barman and said, "Stop it!" "Which way did it go," the Barman replied. This entry was posted by admin on June 1, 2014 at 6:41 am, and is filled under Sunil Bali, The Art of Awesome Living, The Book of Awesome Humour. Follow any responses to this post through RSS 2.0. Both comments and pings are currently closed.